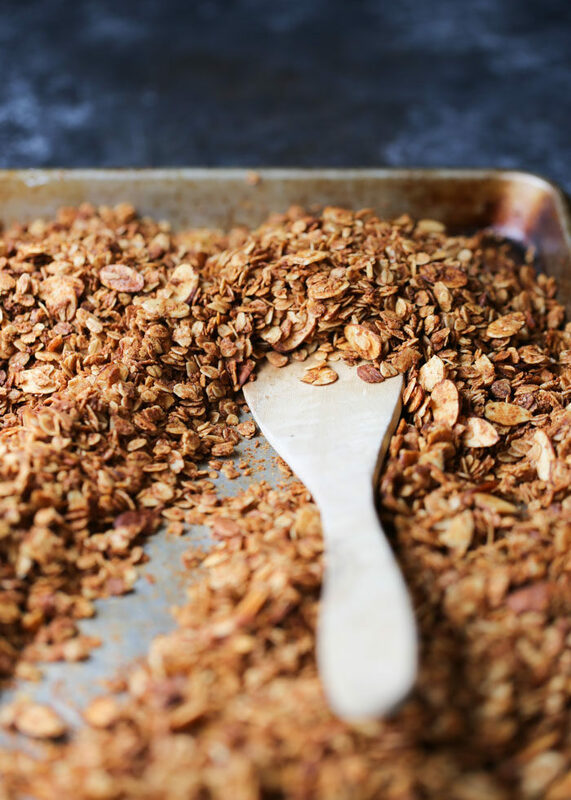 Crunchy-sweet, hearty, and super easy – this homemade granola is a winner. Love it for easy snacks and quick breakfasts. 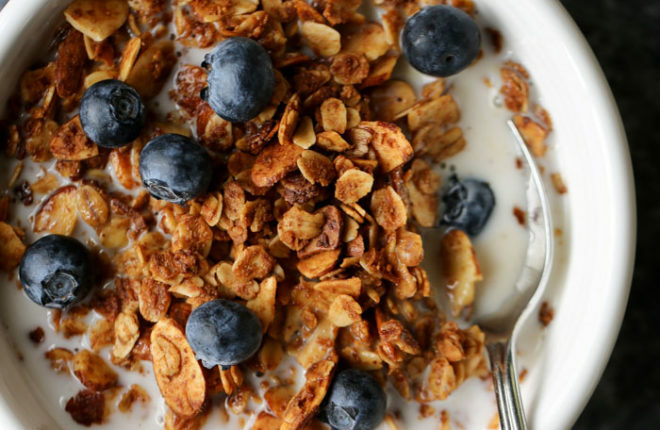 This granola makes me happy. 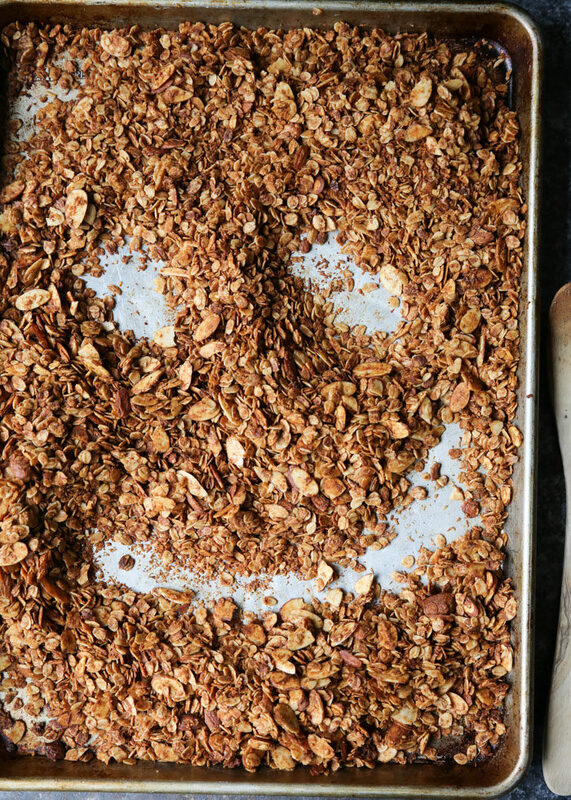 When you smile at your granola, your granola smiles back at you! Okay, so here’s the deal. I wanted a granola with a bit of amped-up protein power, and I’d seen peanut butter added to the mix in the past. So why not give almond butter a chance? I admit I was a bit doubtful when I stirred the almond butter into the oats. Not going to lie, I’ve had a few soggy-ish test batches of granola in my life. 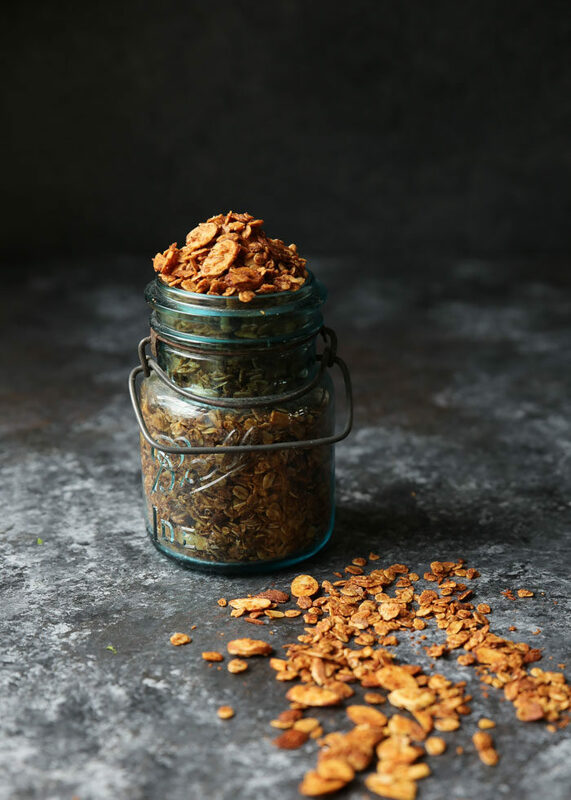 But I was happily surprised when this Cinnamon Almond Butter Granola was absolutely crunchy, perfect granola goodness the very first time around. I took the batch to a girl’s weekend, and it was well-received. That was over a year ago. I’m so prompt when it comes to sharing recipes. That’s okay. 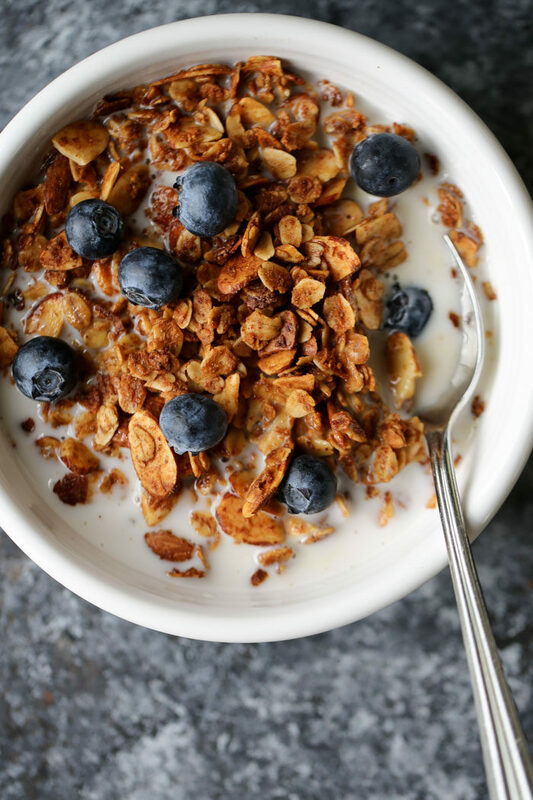 A year gave me time to tweak and perfect and make this cinnamon almond butter granola recipe just right. Really, it’s super simple. Gently warm coconut oil, honey, and almond butter over the stove. 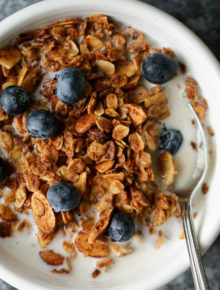 Grab a big bowl and combine your rolled oats, cinnamon, coconut, and sliced almonds. Pour the almond butter mixture over the oats, stir, spread on a cookie sheet, and bake. Have I ever mentioned how glorious homemade granola makes your house smell? Oh my. It’s amazing. Make some. Eat some. Be happy. Granola! That’s probably all I really needed to say. Here’s the recipe! Preheat oven to 325 degrees Fahrenheit. Set out one large or two medium rimmed baking sheets. Place honey, coconut oil, almond butter, and salt in a small saucepan set over low heat. Cook until coconut oil is melted and the mixture is warmed through, 3-4 minutes. Meanwhile, to a large mixing bowl, add the oats, coconut, almonds, and cinnamon. Stir to combine. Pour the almond butter mixture over the oat mixture. Stir until the dry ingredients are well-coated. Spread in a thin layer on your baking sheet(s). Place in oven and cook, stirring every 10 minutes, until lightly golden and fragrant, 25 to 30 minutes. Remove from oven and let cool on baking sheet. Transfer to an airtight container and store at room temperature. Keeps well for weeks! Substitute agave syrup or pure maple syrup for the honey.